Fox Fine Wines & Spirits – a wine bar incorporating a wine shop and full service kitchen over 3 floors – opened in late summer 2015 in the City of London, in the iconic, listed Fox building at 118 London Wall. Originally a shop that hand made and sold umbrellas to everyone from British royalty to JFK, the building has a Grade II listed interior and façade for which we needed Planning and Listed Building Consents, as well as a Change of Use. The facade includes the only neon sign in the whole of the Square Mile. 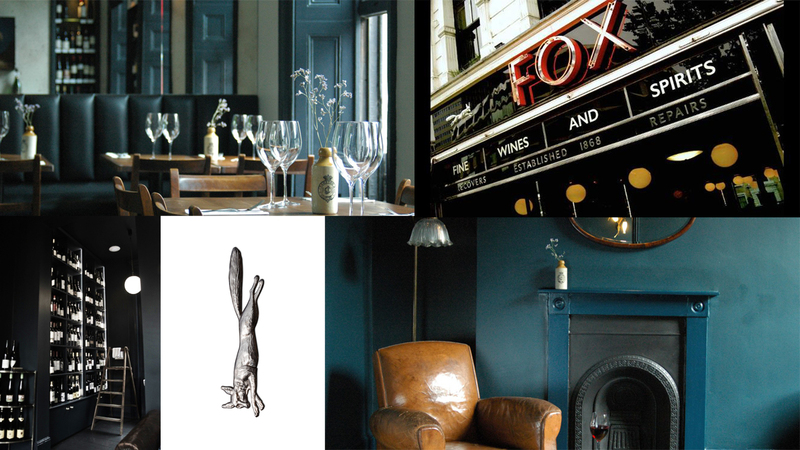 Widely known to Londoners simply as The Fox Building, the rooms have been carefully and sensitively repurposed to offer three unique experiences. On the ground floor, a bustling shop and bar spills out into the pedestrian area outside where table service is available. On the first floor, the dining room offers a relaxed eating and drinking experience, whilst enjoying the view through floor-to-ceiling windows over the green outside. On top floor is the lounge; with leather armchairs, feature fireplaces, and private spaces, it creates convivial atmosphere. On offer are a carefully curated selection of over 300 wines and champagnes as well as signature cocktails, premium spirits and a complementary English influenced food menu.